Beverly's Official Blog | News and findings from world of crafts, scrapbooking and more: Locker Hooking is Back! 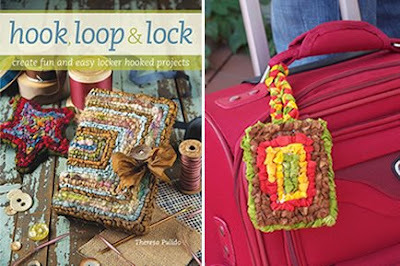 For inspiration and details you must take a look at hook, loop & lock by Theresa Pulido. We fell in love with the projects from this book. So much so, that we created a video to explain the locker hooking technique. You can find the video at the Beverly's web site, just click here. Look for a "how-to" for the luggage tag made by Kathy - coming this fall. talked about in the e-mail. Needless to say, I was very disappointed. I have had this book several months and would like to try this craft. Having trouble finding the hook. Any advice as to where I can purchase the hook. Michael craft and Jo-Ann Fabrics do not have it. It is very disappointing to want to start a new craft and there are no supplies. They have a pad of paper near the checkout to request supplies at Beverly's. I've always found they respond quickly to requests. There isn't a store with 40 miles that has lockerhooking supplies. 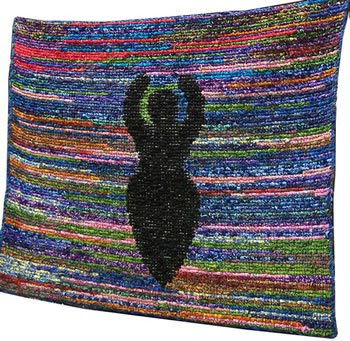 Our group had rug making lessons last summer so I have the tools but no book. It would be nice to at least get the book. I went to Beverly's in Santa Maria last night. We are doing stumpwork embroidery there. Looking for a new book I found the lockerhook book! It was well hidden under some card making books. I bought it and it has some cute project. They said that they would bring the supplies to the store for us! You can buy the basic supplies and pre-cut strips online at www.colorcrazy.com. I love locker hooking but fabric is getting so expensive. Went to JoAnne's and calico was $6.99/yd. Way too expensive to buy 8 yards of fabric to make a rug. Looked online to find fabric strips. Any ideas? I remember buying strips at a craft shop for crocheting baskets. Are any of those businesses still around - it was years ago. You might try the Beverly's website, http://www.beverlys.com/, which offers a "Deal of the Day" featuring three fabrics each day for only $2.97 per yard. You can check the website daily, click on the link in this blog's sidebar, or "Like" Beverly Fabrics on Facebook to see each day's selection. There have been some really pretty coordinating fabrics featured lately that would make great rugs. Good luck with your project!